Backyard gazebos are some of the most fun things to decorate in your yard, but it can be difficult to know where to start if you are used to decorating just your deck or front door. Do you have a backyard gazebo? Are you considering installing one in your yard this summer? 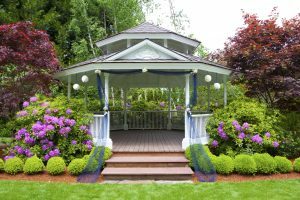 Backyard gazebos are some of the most fun things to decorate in your yard, but it can be difficult to know where to start if you are used to decorating just your deck or front door. How can you beautifully decorate your backyard gazebo this summer? Climbing plants (including roses, clematis, and wisteria) are cool and unique natural decorations for your backyard gazebo. If you want a setup that will also increase your privacy when you are enjoying your gazebo, use raised planter boxes to hold the climbing vines and integrate benches into your design. Add in some cushions and make curtains to serve as the entrance to your gazebo for a relaxing and inviting space perfect for reading a book or enjoying a glass of iced tea. Before you decide how to decorate your backyard gazebo, make sure that you decorate to match the existing style of your landscaping and hardscaping. Do you live on a very rural property or a suburban property? Is your yard cozy-feeling or sleek and modern? Make sure that you match your gazebo decor to the rest of your yard, so that everything coordinates together. The best way to decorate your backyard gazebo is by making it your own! What themes do you gravitate towards? What types of decorations make you smile? Is there a holiday or party approaching that you could tie your decorations into? Try a fun Fourth of July theme starting in June or use a picnic them with fun picnic decorations. Don’t be afraid to let your imagination run wild! Ready for the Backyard Gazebo of Your Dreams?